Registration Workshop is free of charge, with a suggested donation of $5. You must register to participate – Email Steve Miller at steve.miller@wildlife.nh.gov with your name, position, organization/community, and contact information (email and phone). Contact Questions? E-mail steve.miller@wildlife.nh.gov or call (603) 294-0146. Have you ever wondered what your legal protections are while serving as a member of a municipal board or commission? What about your protections from an implied or overt threat of lawsuit over a decision you made as a municipal board member? 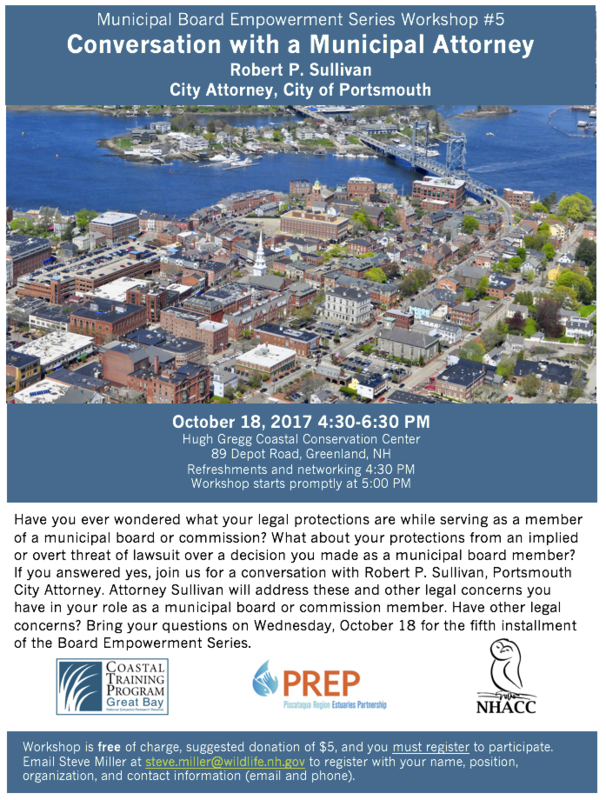 If you answered yes, join us for a conversation with Robert P. Sullivan, Portsmouth City Attorney. Attorney Sullivan will address these and other legal concerns you have in your role as a municipal board or commission member. Have other legal concerns? Bring your questions on Wednesday, October 18th, for the 5th installment of the Board Empowerment Series. Hosted by the Great Bay Coastal Training Program, Piscataqua Region Estuaries Partnership, and NH Association of Conservation Commissions. Refreshments and networking at 4:30pm; workshop starts promptly at 5:00pm.